This was a lovely day! My Mum came to visit and to spoil the kids, as only a Nana knows how. We gave Hubby a day's peace and took the boys over to Morecambe to have a play at Happy Mount Park. We headed straight for the central play area and paid them in for a play on the cars and climbing frames. I fully expected to be sat having a chat with my mum while the kids played, but instead I was sat watching my mum follow Georgie round and "help" him on the climbing frames and slides. I couldn't help chuckling to myself as I know Georgie is more than capable of doing all these things by himself. But Georgie and Mum have a lovely bond and frankly I think she enjoyed trailing around after him. 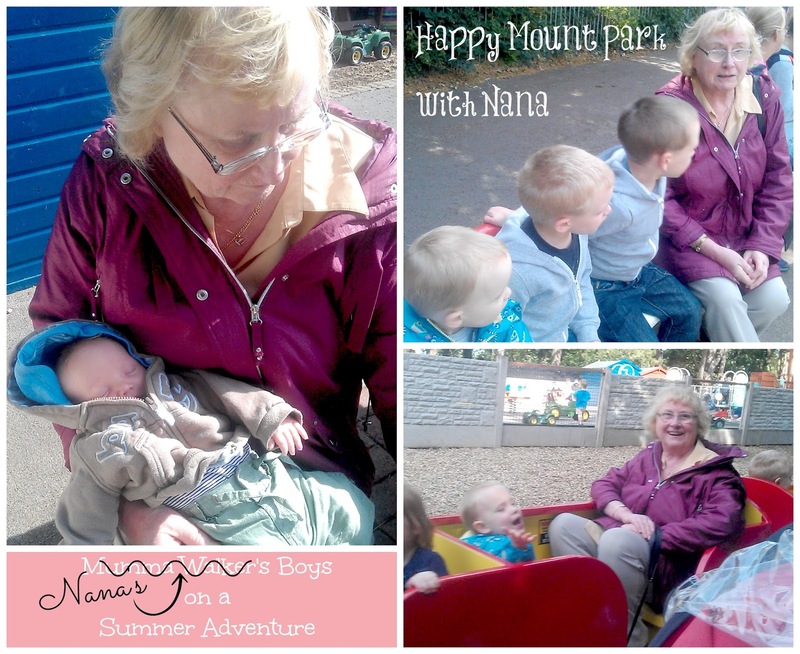 The kids had their snacks and then they wanted to ride on the miniature train with Nana, and then go and play in the Pirate Park soft play area. We took the chance to go and have a coffee while they went crazy on the bouncy castle/pirate ship. We almost didn't get Georgie through the door though as he had his heart set on going on the trampolines... I'd be happier him being a little older and more steady on his feet before I let him loose on those and that resulted in a bit of a tantrum. But he soon got over it. For the first time my lads took notice of the carousel, and begged Nana to let them go on. Naturally she paid up for them to go (see, Nana spoils them, hee hee) and they scrambled on. Tom chose a carriage, Jack & Georgie chose horses. The older lads were not impressed... Not all the horses move and by chance both lads chose static horses. Jack moaned all the way round. Tom complained that his carriage didn't do anything - what did he expect it to do? Georgie, on the other hand, thought it was the greatest thing EVER and grinned all the way round! He cried when it was time to get off..... Oh well. Can't win them all!